Anu is the Great Mother of the ancestor Gods the Danaan. An ancient figure, venerated under many names, she is often known as Aine, or Danu. She is the womb of life. As Aine, her name means "delight, pleasure, melody". She is the spark and vitality of life, she is the seed of the sun in our veins. 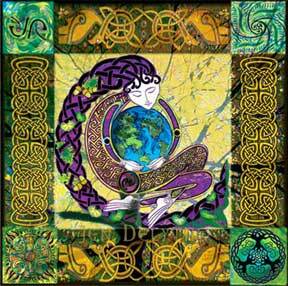 The Great Earth Mother is more ancient than the God of the Celtic Druids. She is the Mother whose breasts are the two hills called the Paps of Anu in Ireland. Her hair is the wild waves, the golden corn. Her eyes are the shining stars, her belly the round tors, or earth barrows from which we are born. Like the cat, the sow, the Owl, she eats her young if they are sick or dying. She is the cycle of life, the turning of the seasons. In this design the four elements of life are represented: air (birds), fire, earth (tree) and water.